Pirate Twin commented on my entry about ballads that today marks 30 years since the Edmund Fitzgerald sank in terrible weather on Lake Superior. In reading this CNN.com story about the wreck and the Gordon Lightfoot song, I was amazed by this figure: 6,000 ships have disappeared in the Great Lakes. It's hard to imagine 6,000 ships scattered at the bottom of the Great Lakes - and with them, the remains of many crew members, surely. A ghost fleet, silent and dark, moored at lake bottom. A museum dedicated to all of those ill-fated ships lost out upon the deep waters. I still choke up when I think about the "Edmund Fitzgerald" and her lost crew, forever memorialized in the sad lyrics of Gordon Lightfoot's song of tribute. On November 10, 1975, the SS Edmund Fitzgerald sank into the waters of Lake Superior. The ballad "The Wreck of the Edmund Fitzgerald," sung by Gordon Lightfoot, was a well-deserved tribute to the 29 men who died that day. Although the words of the song seem to indicate that the captain and crew knew they were doomed, it is now believed the sinking of the Fitzgerald was so rapid that the men did not know the full seriousness of their plight. No attempts were made to leave the ship by lifeboat. No distress signals were ever issued. So what caused the Edmund Fitzgerald to sink? One documentary on the Discovery Channel said it was likely that "complacency" took her down. In the tradition of the Titanic -- she was believed to be unsinkable. 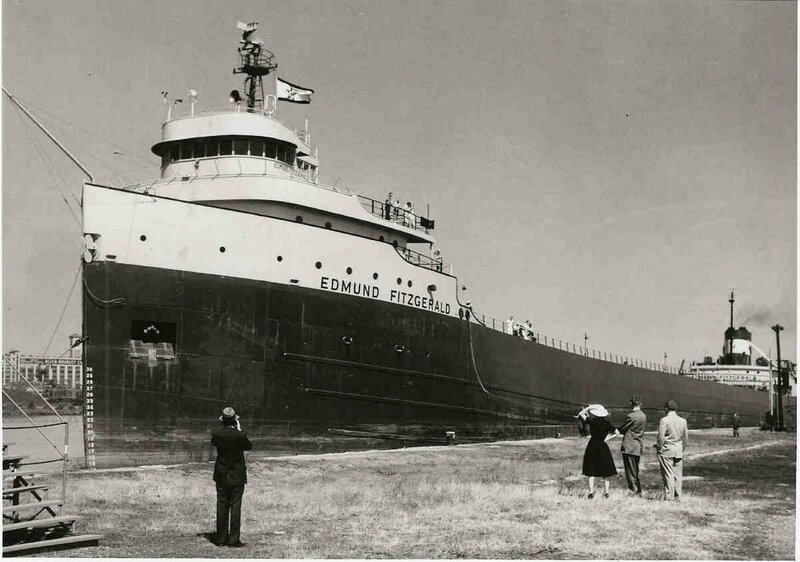 7 June 1958, the Edmund Fitzgerald is launched on the River Rouge from the Great Lakes Engineering Works (GLEW). The Fitzgerald becomes the largest ship to sail the Great Lakes, a title she will hold for eleven years. In 1969, the Minimum required freeboard is reduced by the American Board of Shipping (ABS). On 6 September 1969, the Edmund Fitzgerald ran aground near the Soo Locks, resulting in considerable internal and external damage. 1969-70 Winter layup: Additional vertical stiffening is added to her keelsons to correct a cracking problem. 1970 30 April, collision with S.S. Hochelaga. 1971: Freeboard is again reduced by ABS. 1971-72 Winter layup, Duluth, Minnesota: Converted from coal to oil. 1973-74 Winter layup: The cracking problem has reoccurred, corrected by welding. 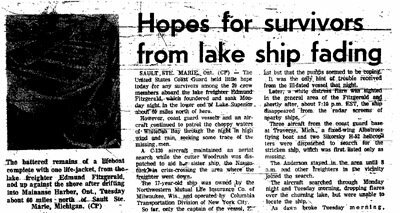 7 Jan 1974, Detroit River: About one mile west of Belle Isle, the Fitzgerald loses her bow anchor. 17 June 1974: Again, the Soo Lock wall is struck with damage. 31 October 1975, Toledo, Ohio: The Coast Guard inspects the Fitzgerald. Lt. William R. Paul of the Coast Guard Marine Safety Office notes the problems on Form CG 835. She is found to have damaged hatch coverings on three of her hatches. The ship will not be permitted to sail next spring unless repairs are made. However, she is allowed to continue sailing without repairs for the remainder of the shipping season. 4 November 1975: The Coast Guard writes Oglebay Norton a letter, informing them of the damaged hatches. The Fitzgerald is considered seaworthy to face the November weather but must have the repairs made before spring. 2:39 PM: The weather service posts gale warnings. On the Anderson, Captain Cooper radios to a freighter he sees behind him. "W4805, Arthur M. Anderson to the vessel northbound abeam Knife River. Do you read me?" "Anderson, this is the Edmund Fitzgerald. Over." No weather report is received from the Fitzgerald. Her estimated position is 11 miles northwest of Michipicoten Island. The Edmund Fitzgerald rounds Caribou Island near "Six Fathom Shoals." "Look at this, Morgan. That's the Fitzgerald; he's in close to that six fathom spot." Morgan replies "He sure looks like he's in the shoal area." The Fitzgerald has two radar sets but both use a common antenna. The Fitzgerald calls on the radio to the Arthur M. Anderson. "Stand by. We don't have the equipment here to tell if it is operating properly. I will call you back." The Fitzgerald radios the Anderson again, asking for a position. "What's that, Fitzgerald? Unclear. Over." "We are holding our own." Thanks, PT, for that account. And VO, I still get massive goosebumps whenever I hear the song. I always will, I reckon.